Room 202 is located on the second floor of the Mansion. It features Tudor-style natural wood paneling and large windows with screens that allow fresh country air to flow through. 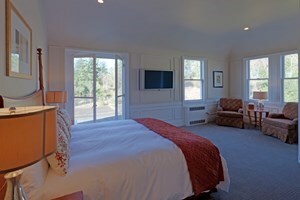 The front wall of windows overlook the English garden, and it’s also the perfect room for watching the sunrise. Furnished with a King-sized bed, large flat-screen TV, and mini fridge, this room has an entry hall with a glass-paneled French door that opens to the sleeping area. The on-suite bath includes a whirlpool tub with rain shower. 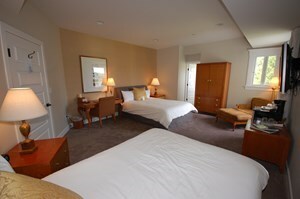 Room 307 is one of the most popular rooms in the Mansion. Located on the third floor, it practically features three full walls of windows and two private balconies. Furnished with a King-sized bed, armoire, desk, comfortable reading chair, large flat-panel TV and an in-room refrigerator, the room includes an on-suite bath with a whirlpool tub with rain shower. Room 310 is located on the third floor of the Mansion and features a coved ceiling and a private balcony, where you can enjoy views of the English garden and the mountain range, as well as a spectacular sunrise. Furnished with a King-sized bed, a large flat-panel TV, and an in-room refrigerator, the room has an on-suite bath featuring an oversized whirlpool tub with rain shower. 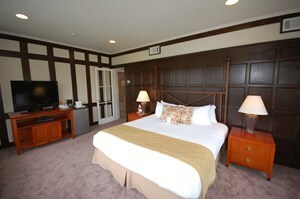 Room 312 is located on the third floor of the Mansion and features a curved wall of windows overlooking the pool deck. Keeping with the curved theme, the on-suite bath for this room has an oval soaking tub with rain shower. 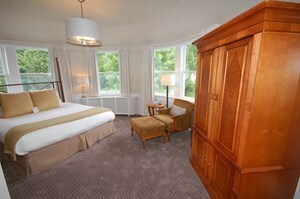 Additional room furnishings include a king bed, large flat-panel TV, writing desk, armoire, comfortable reading chair and in-room refrigerator. 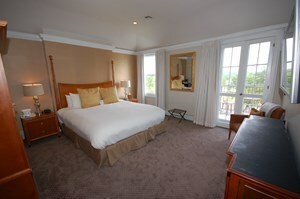 Room 313 is located on the third floor of the Mansion with a private balcony overlooking the tennis courts. This spacious room is furnished with a King-sized bed, reading chairs, armoire, large flat-panel TV and in-room refrigerator. The on-suite bath includes a whirlpool tub with rain shower. 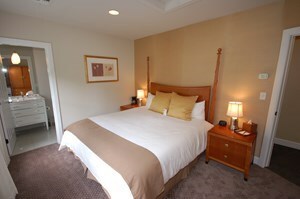 Some rooms are designed to accommodate more than two guests, either with several beds or the use of a rollaway. In cases where more than two guests are staying in a room, an additional $30 per person, per night, will be charged. A 10% discount will be enjoyed by groups booking six or more rooms; when all rooms are booked by a single group, even deeper discounts may apply. Advanced reservations require a minimum 2-night stay. A 50% deposit is required to secure your reservation at the time of reservation. The balance for your stay is due upon departure. The Mansion at Noble Lane is licensed by the State of Pennsylvania to offer a fully stocked bar. Enjoy fine wines and spirited cocktails, which we’re happy to sell and serve at the bar and throughout the inn. PLEASE NOTE: Guests are only allowed to consume outside alcoholic beverages in the privacy of their room. To ensure the comfort and contentment of all guests, especially you, we respectfully ask that cellphones not be used in dining areas and in YOUtopia spa.